One thing I have learned over the years is that Alzheimer's caregivers tend to blame themselves too much. Caregivers often agonize over things that go wrong. They often wish they had done more. Caregiving for a person living with Alzheimer's is not easy. In fact, most would agree that is the most difficult thing they have done during their entire lives. One of the biggest reasons we do not do more is because we often have no clue what to do. In the beginning it would be safe to say most of us have no idea what we can or should do. We wake up one day and we are an Alzheimer's caregiver whether or not we know it at the time. We have a zero frame of reference. We have little or no life experience that helps us to understand, cope or even how to change our communication so that we can thrive, work, and live with our loved one living with dementia. I wrote many times that Alzheimer's is a sinister disease. It kills the brain of the person living with Alzheimer's, and it tries to kill the brain of the Alzheimer's caregiver. Alzheimer's has very long tentacles. Approximately 40 percent of Alzheimer's caregivers suffer from depression - or what I call deep sadness. Life is not easy for an Alzheimer's caregiver under any circumstance. I think we all know things can go horribly wrong at any moment. This alone makes living the life of an Alzheimer's caregiver difficult. Often emotionally gut wrenching. Let me start by making this clear. I took care of my mom at home for 3,112 days. I first started thinking about Alzheimer's in December, 2004 when my mom was diagnosed. I can say with certainty that I have been thinking about Alzheimer's and caregiving every single days since then. For 13 years. I never stop thinking about caregivers. I can's say why -- other than because I understand how they feel. I know what it is like. And, I know that over 1,200 new Alzheimer's caregivers are being born each day in the U.S. Read that last sentence again - it is mind boggling. More than 1,200 people join our ranks each day. I can assure you - I get new and better ideas about caregiving all the time. I think and I think and I think then I get a new idea, or I figure out how to improve one of my existing techniques. I then give my new idea to someone and ask them to let me know if it works. It is like magic - it works. I can teach anyone how to get an Alzheimer's patient to take a shower, how to get them to take a poop, how to get them to eat more food, and how to them to take their medication. How to get them to cooperate, what to do when they get mean. By now you might be thinking no way, or maybe you are thinking how? Let me be clear on this. None of these techniques happened and worked over night. I had eight and a half years to figure them out. One of my best ideas - how to get an Alzheimer's patient to take a poop - took me over 6 months to figure out. My sister Joanne can testify to this. One day while she was visiting I had the poop problem. I told her straight out - by the next time you come back - 6 months - I'll have this problem solved. She was truly amazed when she came back - problem solved. I could explain to you how to do this in just a few minutes - it took me six months. Joanne often laughed when she visited us and I would say to her - in the next 2 minutes mom is going to say - I'm hungry, I'm starving. Now Joanne knew that Dotty had just eaten. But, right on cue she said, I'm hungry, I'm starving. Do you know how many arguments I had with my mom in the first couple of years where I tried to explain to her that she couldn't possibly be hungry because she just ate? My point here is simple. If you can't figure out what to do - start trying. Don't beat yourself up. I can assure you that you are going to have new and different problems all the time. They just keep coming. Here is what I did to solve the above problem with my mom. Instead of trying to convince her she couldn't possibly be hungry because she had just eaten, or by berating her, Or arguing with her, I would simply say - okay, give me a few minutes and we will eat. This usually pleased her and made her smile. Just so you know, my mother never stopped saying - I'm hungry, I'm starving. What I did was start listening to her. I mean if she said she was hungry, then she felt hungry. Whats the big deal? Here is another example I don't like and it has happened to me many times. I meet a professional that works as an Alzheimer's caregiver. They tell me they can't get the patient to take their medication. I say, I can solve that problem for you. They tell me straight out - it won't work. I say, how do you know it won't work, I didn't even tell you the solution yet. Then I tell them the solution. Guess what they say - it won't work. I say how do you know that - you didn't even try it. Now to be honest I want to get angry. But, I don't. Instead I say to them - just try it. At the time I am thinking to myself - this person ought to be fired. One thing I know for certain. If you keep telling yourself it won't work, or there is no solution - you are going to be right. It is called - a self fulfilling prophecy. My goal is always the same - try and help. If you don't want my help fine by me. The biggest challenge I have is getting more people to come into the Alzheimer's Reading Room and subscribe. Right now about 37,500 active readers. You know what, I wish that number was more than a million. The Alzheimer's Reading Room operates for the benefit of society. This is not a big money making operation. I could make more working for Uber. If you have a problem, a question, if you are seeking advice why not search our Knowledge Base. Put in a word, a sentence, or ask a question. If you don't get a satisfactory answer - use the contact button and send me the question. If I don't know the answer, I'll try to find someone who does. We also like to answer questions and then add the answers to our Knowledge Base. Here is a good example of how this works. Alzheimer's Team asked me to answer this question they received from one of their readers. When I read it I went yikes - I can't answer that and I didn't think anyone could. I did decide to ask our expert Dr. Rita Jablonski. Lo and behold she didn't even flinch. She told me she would would write up an answer. Here is the article. By the way before asking us for an answer Alzheimer's Team searches our Knowledge Base to see if we already have the answer. If so, they link to our existing article on their Facebook Page and share it with their followers. I think Rita Jablonski is the second best resource for caregivers in the world. Wanna guess who I think is the best? You can find more from Rita by searching our knowledge base. Better yet, click here and see what you get from her (right here) - Rita Jablonski. Rita also shares her wisdom on her own blog - Make Dementia Your B*tch. I want to add a personal note to my fellow caregivers who have gone the distance; or who have had to place their loved on in a memory care facility. You often tell me you wish you could have done more. You are sad about this. Now it is not up to me to tell you how to feel. However, I would like you to think about this. If you didn't take care of your loved one - what would have happened? Caring for a person living with dementia means caring for a person who needs you so much they could not operate or even live on their own without you. When you care, and no matter how you do it, you are operating at a very high station in life. I believe caring does one thing we might now have yet imagined - it allows us to live a meaningful and purposeful live while doing it. How many people can honestly say they lead a meaningful and purposeful life? Think about it. I once described my life to Jane Gross of the New York Times this way. "I have a life that is rich in experience, and is now rich in spirit." I made that response when it was inferred that in some way I had given up my life for my mom. Nothing could have been farther from the truth. It is the spirit within us that carries us along as we care. We use our heart and we use our brain to the best of our ability. It is not our fault that our loved one is living with Alzheimer's. So we do that best that we can. When it is all over and done we have accomplished more than anyone can ever imagine. Looks around you. How many people can make that claim? In closing. Everyone around you understands your great accomplishment. Ever been told you are a Saint? 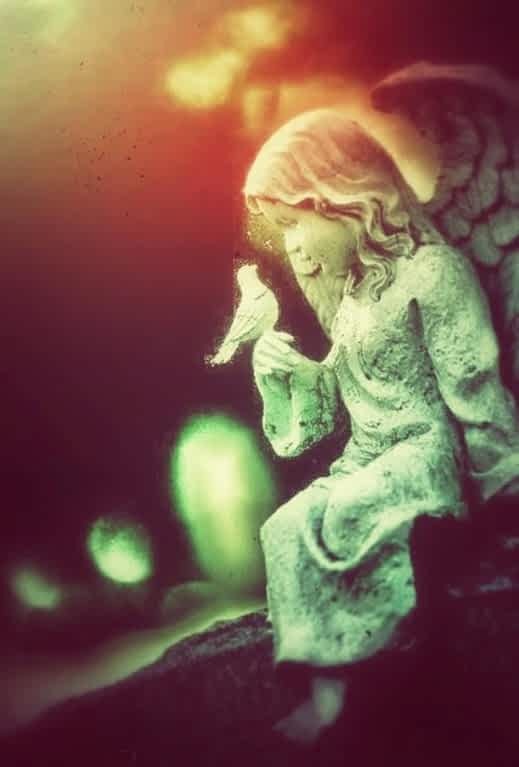 Ever been told you are going to Heaven? Those are wonderful compliments of the highest order. As for me? Does it matter that so many know what I did for my mom? Not really. What matters is I did it. Nobody can take that away from me. And I hope you will come to the same conclusion. "The Alzheimer’s Reading Room is what it claims to be – and more." "This comprehensive site is run by full-time caregiver and gifted advocate Bob DeMarco. 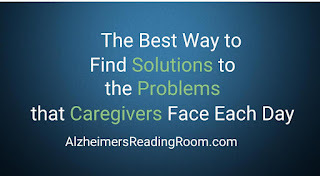 Thanks to the tireless efforts of everyone at the Alzheimer’s Reading Room, you have a go-to place for advice, education, and an occasional laugh. Stop by, and start feeling empowered to handle life as a caregiver." Title:"Care of Dementia Patients, It's Not Your Fault"